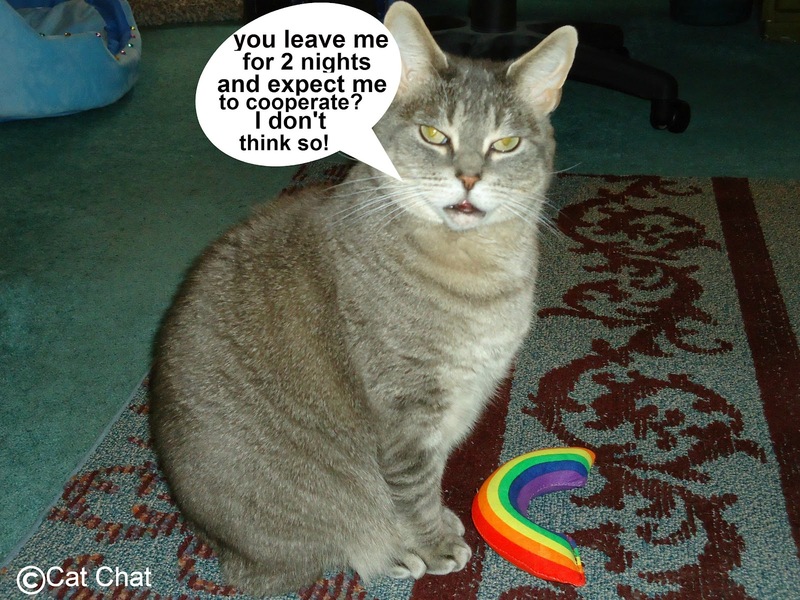 Cat Chat With Caren And Cody: Yeowww! 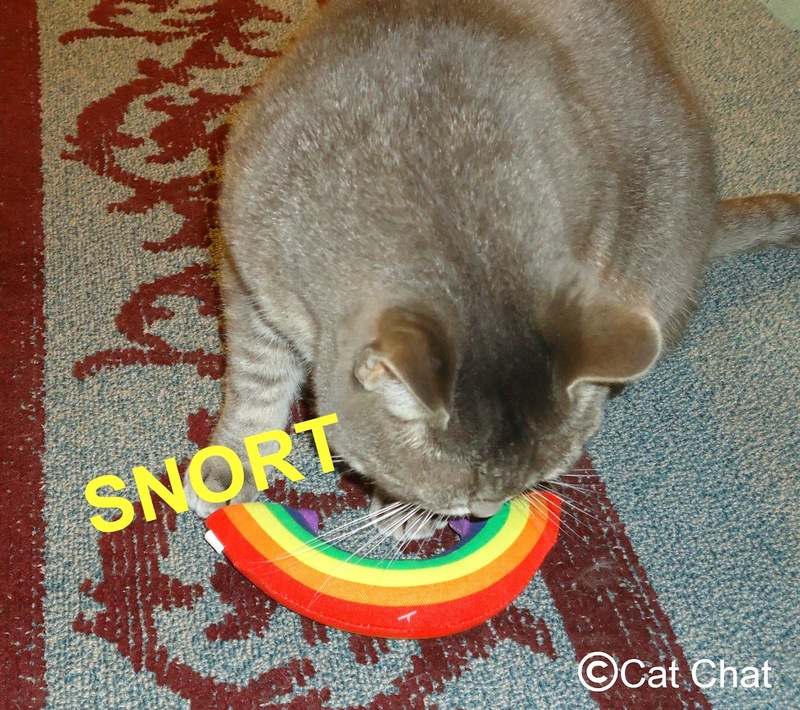 Rainbow Catnip Toy from MyFavoritePetShop.com Enter to win! Yeowww! 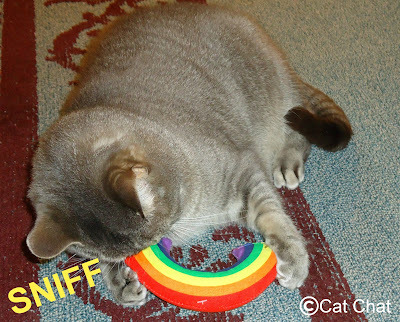 Rainbow Catnip Toy from MyFavoritePetShop.com Enter to win! 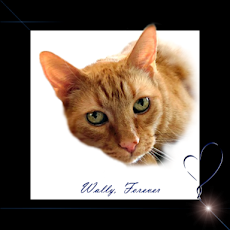 Hi my kitty friends! Happy Monday! The catnip is grown in the U.S. It is pure kitty bliss! That is...for MOST CATS....even me. Except for yesterday. Allow me to explain. I ADORE Yeowww! Catnip toys. I have given them rave reviews. Yesterday when I began to play with my toy, my Sheltie brother knocked over our baby gate creating a LOUD BOOM! Not once, but TWICE! It scared me!! That was it. I wouldn't touch the Yeowww! Rainbow toy for my Mom to video since she waited til the last minute to film. No way Jose!! On top of that, she thought I was going to give her 2 minutes of recorded catnip bliss after she LEFT ME for TWO WHOLE NIGHTS while she catted around with a bevy of different animals at the Meet Purina Pet Blogger Summit? 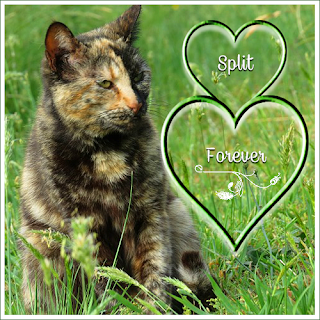 She came home reeking of dog food, pigs, cows, goats, rabbits, dogs and GASP...OTHER CATS! There was no way I was going to cooperate. I'm not yesterday's news, no sirree!! These photos I'm gonna show you are as good as it's gonna get! Trust me, I WAS enjoying myself! There was NO WAY when I saw that video camera come out that I was gonna have Mom get ANY footage! Payback is a... well you know what it is! I wasn't gonna give her the satisfaction of seeing me REALLY enjoy this toy!! I'll wait until she is snug in her bed with visions of all of the fun that she had in St.Louis, dancing in her head! 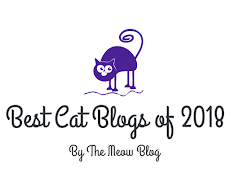 www.myfavoritepetshop.com is offering all of my readers a SPECIAL 40% OFF SITE-WIDE discount with coupon code PETBLOGS40. All you have to do is register on their site by clicking right here THE COUPON CODE EXPIRES ON OCTOBER 31ST AND THAT IS NO TRICK! YOU CAN!! MyFavoritePetShop.com is going to give ONE Yeowww! 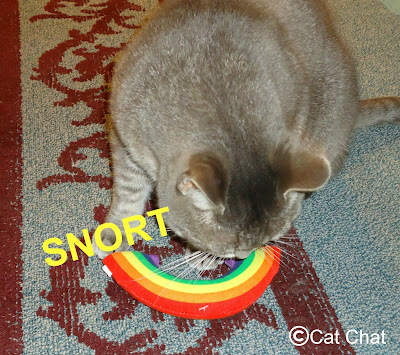 Rainbow Catnip toy to ONE lucky winner who is 18 yrs of age or older and who lives in the U.S. Just leave a comment telling me you would like to win by MONDAY, OCTOBER 15 at 11pm EASTERN. Winner will be announced on WEDNESDAY, OCTOBER 17th. GOOD LUCK! Now if you will excuse me I'm gonna go get my groove on with this great toy while Mom is busy doing whatever it is that she does. She has photos but no video....my work here is DONE! Disclosure: I was not compensated for this review. 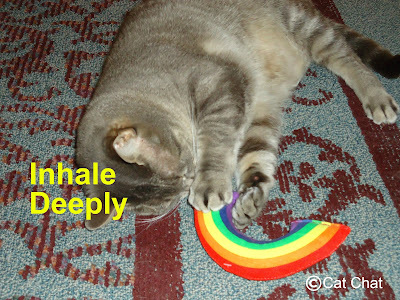 I was given a Rainbow Catnip toy to play with. All opinions are my own. About Purina Disclosure: Mom's trip was completely paid for by Purina. Mom was not required to blog about the trip, but is going to be posting a few blog posts about it because she wants to! All opinions are Mom's. Ooo awesome toy! We understnd not cooperating with her pictures, but it looks too good to resist! Count us in on the giveaway! 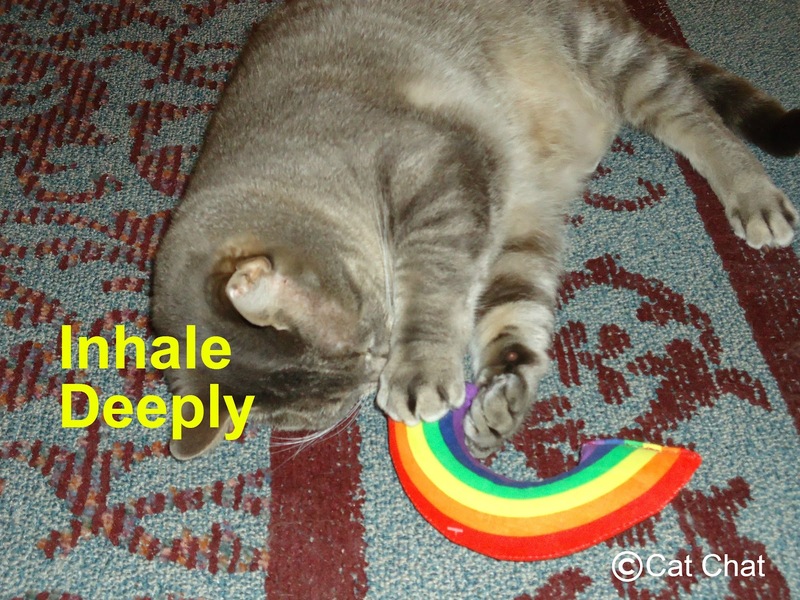 My kitty would love to win this Rainbow catnip toy!!! Cody, we wanna have a turn! I recently received a YEOWWWW heart from my girl so I know exactly how much fun it is! Good work on denying Mommy the satisfaction of video taping your enjoyment. HAH! 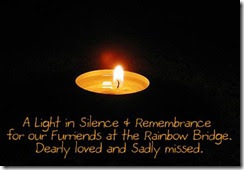 WE would love to have a rainbow toy. That looks like fun. Take care. Good for you Cody.....make sure your Mom knows you were NOT amused by her two day absence and returning home smelling like other cats and "things" !! Enjoy your new toy (when she isn't looking of course!). I hope you didn't break your mom's heart, Cody! My cats are under age. But I'm 18...or older. Not telling the exact year. I feel like I might be breaking the law by winning nip for my underage fur babies though. Oh well. 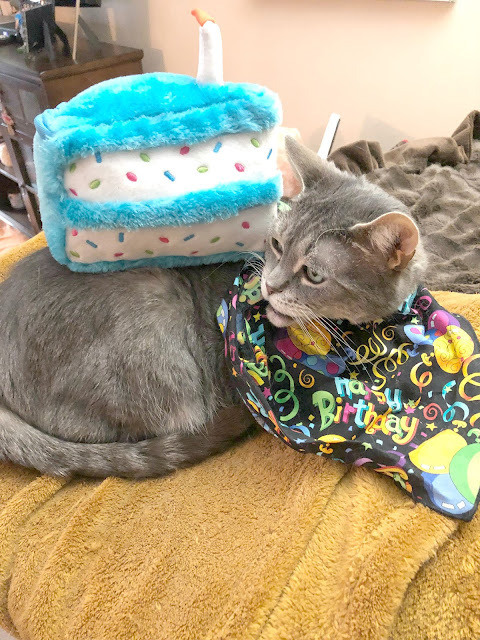 so totally would love to win the rainbow catnip toy.. but since I won the Kitty'scape can I?? I love those Yeowww toys too! I've never seen the cute rainbow one before! It looks very bunny-kickable! Sorry we haven't been around much..."someone" got "busy"...excuses, excuses. What's a kitty to do? You did the right thing Cody! Humans have got to understand what consequence means! Cody, babe—you are indeed king of the jungle! Thanks for the great giveaway—you are indeed a benevolent and generous ruler! Good for you, Cody! Demerits for your mom...please enter us! That does look like fun Cody! Take it easy on Mom though, she was working hard while she was away! Hey Cody...Now that you are away from your Mom, was it the most? I absolutely love the nip. Mom calls me "The Nip Junkie". Can't help myself...it's the bomb! And speaking of bombs...well, you know! Enjoy! I have one or maybe I HAD one but it did nothing for me, sorry to say. I don't go for Yeowww! nip. Oh Cody you make me laugh! You just couldn't resist a little "nip" could you. Well I give you credit for trying to hold off. I hope you enjoyed your little "trip". hee!hee! 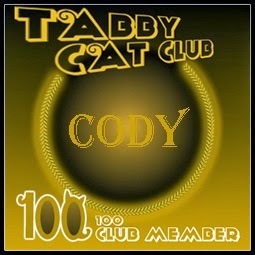 Oh Cody that looks pawsome. I love those nip toys too. I love my nanner, I bet I would love the rainbow too. Please enter us! We'd love to win one of those rainbows ... they look potent and FUN! I'd like to win. Looks like a bunch of fun for the kitties. Thanks for the giveaway. 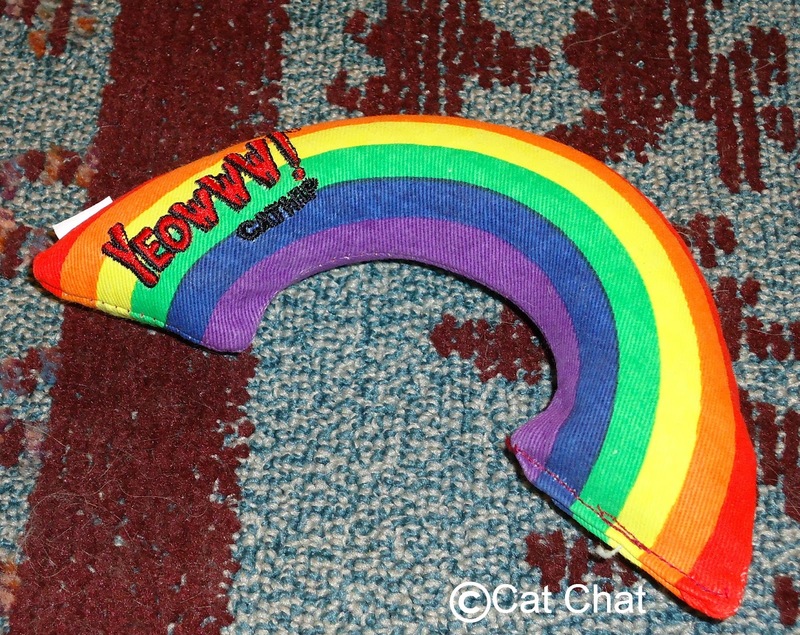 I'd love to win this catnip rainbow for my cats! 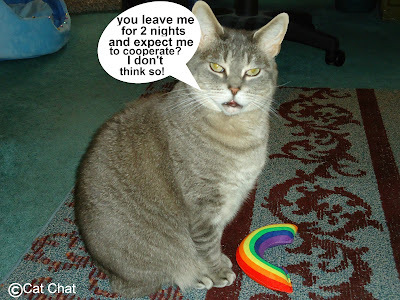 We read at Glogirly about that rude Rocki cat! And a whole lot of other fun stuff!! Can't wait to hear more, speshully about the FOOD. Truffle LOVES Yeowww Catnip toys and would love to win this rainbow. We love Yeoww! So glad you posted. They'd contacted me and I wasn't sure whether to blog about them. Can't wait to see Purina pics!!! We would like to win! You know why? Our mom went away this weekend and didn't bring us ANYTHING! The cheapskate. oooooh we wants to win this one REAL badz!!!! Tater Tot would love this thing as Maxwell has taken hold of the Yeowza green fish and torn it to pieces. We now have no more Yeowza toys so to win one would be GR-EAT!! !